Bulletsafe.com is excited to announce the debut of its newest product, an inexpensive K-9 Bulletproof Vest, complete with Level IIIA protection, for just $499.�Comparable K-9 bullet proof vests cost upwards of $780, and BulletSafe's low cost is unprecedented. BulletSafe manufactured their K-9 Vest to make bulletproof vests for dogs more affordable, while offering the same great protective features as other K-9�vests on the market. BulletSafe specializes in making inexpensive bulletproof vests and other protective gear, at a fraction of the price of other manufacturers. 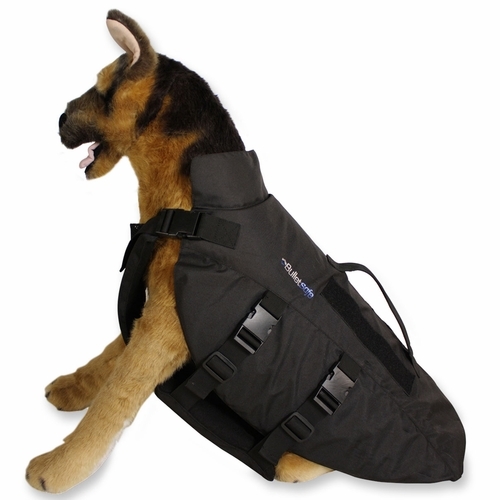 The BulletSafe K-9 Bulletproof Vest also offers S-1 level stab-proof protection on the chest. Stab protection is useful if your dog may encounter stab-like threats. This is great not only for pursuit scenarios, but also for hog-hunting dogs, and other situations. The BulletSafe K-9 Vest is a great vest designed to meet the needs of any large K-9. We are proud of our vest and its price. It is priced hundreds of dollars less than other K-9 bulletproof vests, while offering equivalent or better protection. Other features include a top-handle that is rated for 500 pounds of force, and a velcro area where you can adhere identification. The vest uses six adjustable buckles to facilitate a perfect fit. Bulletsafe.com is home of the $299 IIIA Bulletproof Vest, an inexpensive vest at an unbelievable price. Bulletsafe.com specializes in creating low-cost, high-quality protective gear for law officers, security guards, preppers, and everyone interested in personal safety.�Bulletsafe.com also makes ballistic plates, backpack panels, an alpha vest, and a bulletproof baseball cap.�Tom Nardone, President of Bulletsafe, is available for questions or conversations at 1-800-809-0610.